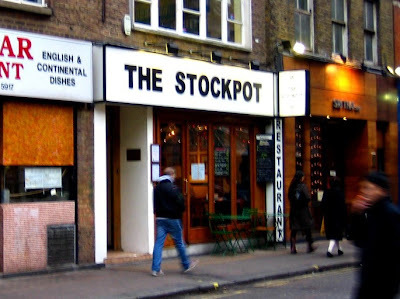 The Stockpot Restaurants, on Old Compton Street and Panton Street, are typical theatreland restaurants with a plan to feed people as quickly as possible. That said, they're cheaper than average and have a certain charm which is made better by being able to get a no-frills multiple-course meal for less than a tenner. The food isn't exactly worthy of a Michelin star, but it is fine, the staff are friendly and it's a perfect spot for a quick bite to eat between other things when you're in central London. The restaurants are at 18 Old Compton Street, in Soho and 38 Panton Street, just off Leicester Square. Click here and here to see the locations on a map. ^Picture from Flickr courtesy of antmoose^.